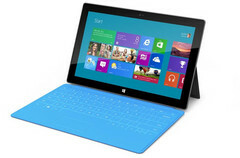 According to a recent update from Bloomberg it has been suspected that Microsoft Surface tablet which has been much talked about might be a Wi-Fi only device. They have said that few people who are familiar with the tablet’s specifications have told them that the device will be on sale without any mobile-phone network connection. This device is also expected to run on Microsoft’s latest next generation Windows operating system and is also expected that this tablet will be the first from Microsoft and will be their first step into the tablet market. Microsoft has only unveiled the device recently, till now they have not released any kind of details about the specifications of the device. Many believe that this tablet might be able to be called as the direct competitor of the Apple’s iPad, but as now we suspect this device might not have a mobile network connection it may not be called as a direct competitor, as Apple’s latest iPad released in March is equipped with the LTE and even has the option of a mobile-phone chip. However it might compete with the iPad model with the Wi-Fi only model. Bloomberg has also reported that Microsoft is planning to release the Surface to the market later this year and they will be working with Pegatron, which is also Apple’s iPhone maker for to manufacture these devices. These reports will be clearer after an official confirmation, but till now we haven’t heard about any official confirmation about this news.